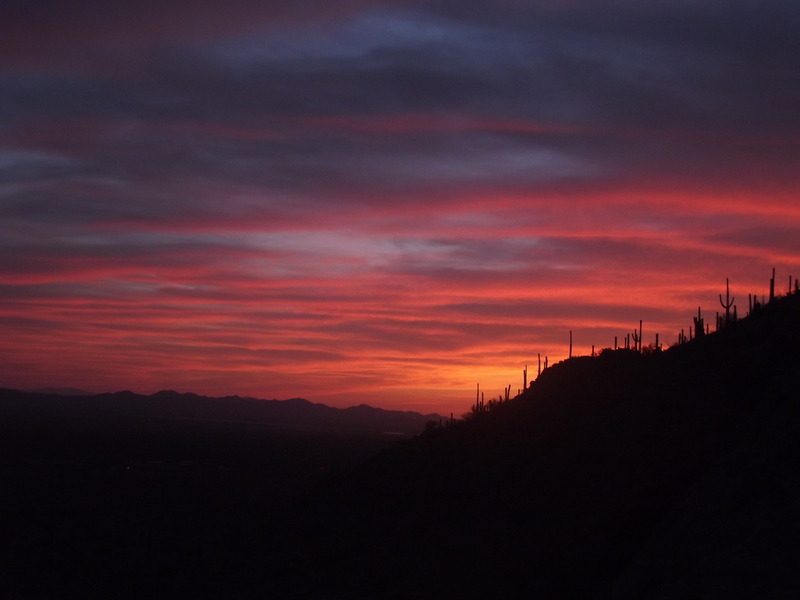 The painted desert, the Sonoran, home of lumbering Pipe Cacti, coyote, sidewinders, rattlesnakes, mice, owls, eagles, desert primrose, hawks, roadrunners, sunsets that wrap the day up with a bang and towering mountains of the Santa Catalina range. The fragile ecosystem of the Sonoran is disrupted by roads. Roads used for transporting tariff-free goods from Mexico to the United States and vice versa, roads which welcome U.S. citizens to pass, roads which carry U.S. Border Patrol to remote parts so they may patrol the border. 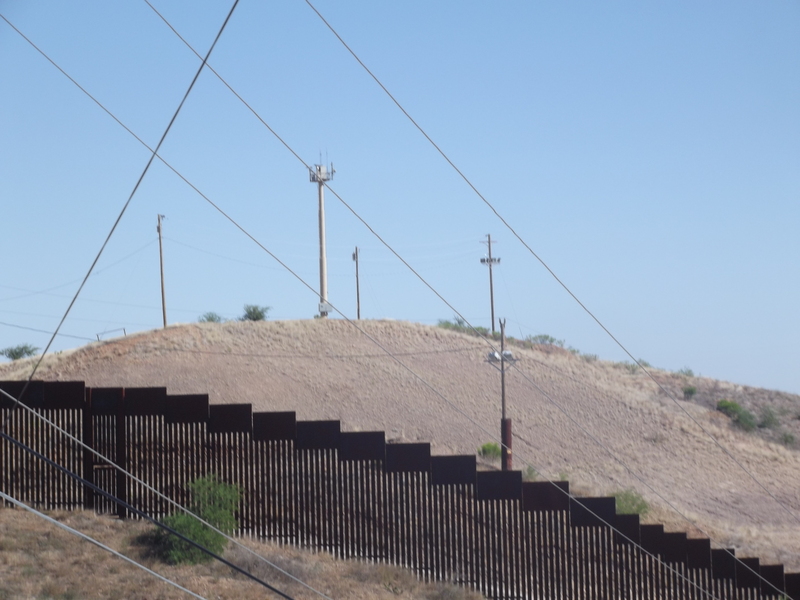 A visible, visceral wall lines the border as a tangible reminder of who is and is not welcome into the United States. The Sonoran desert drew me into the conversation of US immigration policy; it called me to witness the human rights violations being committed within it; it called me to walk its trails of hope and hopelessness. In the desert, I walked along migrant trails which were littered with socks, jeans, underwear of persons frequenting the trails in the hope of crossing the border undetected. I stopped at a shrine on the trail which was created by migrants who passed through and stopped for a rest and prayer to the Holy; there they left small crosses and pictures of St. Jude, the patron Saint of Lost Causes. 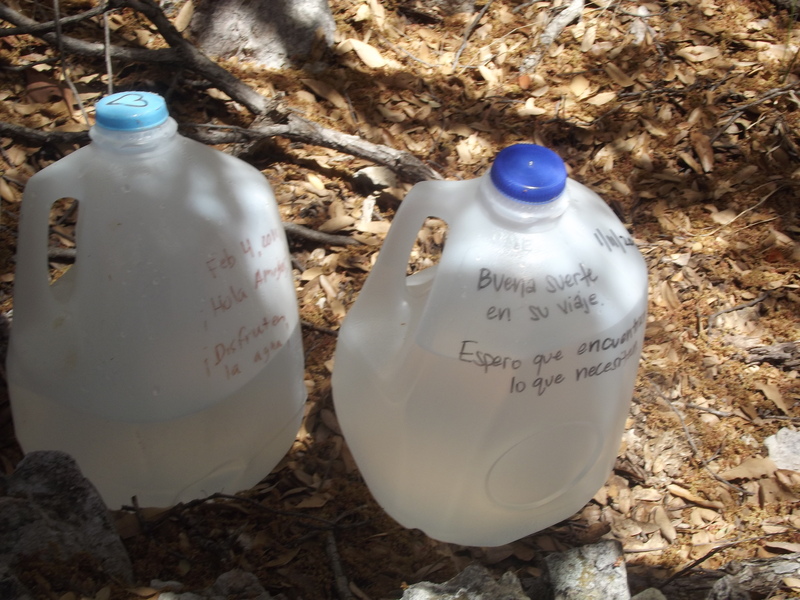 At critical parts of the trail, a humanitarian group called No More Deaths left water in milk jugs with messages written on them. Some said “this water is safe to drink” because they are often told by their trail guides, or coyotes, that the water has been poisoned. Some messages were those of hope and love. The dichotomy of the unforgiving desert and inhospitable wall was countered by pictures of St. Jude and gallons of water from persons who cared. It seemed to me like many folks in this country, legislators, citizens, officers have forgotten basic human rights. Over 6,000 basic human rights. To date, over 6,000 bodies have been found in the desert and this count increases daily, especially as the summer temperatures soar well over 100 degrees. It seemed like we forgot basic human rights when I heard personal accounts of detained migrants treated like dogs as they ate their food off the floor in detention and stories of cells being incredibly cold. It seemed like we forgot basic human rights when I sat through two hours of migrants being charged with criminal offenses for coming over the border and being given about 45 seconds a piece with a judge to accept a plea bargain. Or maybe it was when these men and women came in the courtroom with their hands and feet shackled that we forgot human rights. It seemed like we forgot basic human rights when I stood in Nogales, Mexico where a US Border Patrol officer shot 16 rounds through the wall and killed 16 year old Jose Antonio for throwing rocks at him. Quaker support, conducted night-time border crossings of many refugees and then housed them in the sanctuary of the church. On average, Southside would host 50-100 refugees a night. In 1982, Fife and others were indicted by the US Attorney’s Office and decided that they would go to the media to highlight this grave injustice and need. When Southside went public with this, the response by US churches and synagogues was staggering. Within two years, 237 houses of worship across the United States had declared sanctuary and welcomed refugees coming across the border. Colleges and universities also joined in what became known as The Sanctuary Movement. Somewhere on the order of 13,000-15,000 refugees received Sanctuary during that time until eventually Fife and others sued the US Government and settled out of court; the government agreed to cease all deportations from Guatemala and El Salvador, giving asylum and work permits. Fife went on to say that “the church is right in the middle of the empire and the largest section of the church has blessed the empire, but at the same time, there has always been a segment of the church who has moved to active resistance.” This resistance is something that Southside did not see as a choice, but an obligation because they were paying attention and giving voice to the immediate needs of the Tucson and surrounding communities. What does it mean to be the church in the context in which we find ourselves? We are reminded of ancient Hebrew hospitality in the writings of the Torah: “When an alien resides with you in your land, you shall not oppress the alien. The alien who resides with you shall be to you as the citizen among you; you shall love the alien as yourself, for you were aliens in the land of Egypt: I am the Lord your God.” (Leviticus 19:33-34, NRSV). We are reminded of Christ’s parable of the Good Samaritan wherein a Samaritan, who shared the same heritage of the Jewish man but their tribes were enemies, saved a Jewish man. Here this story shows that hospitality was given by the least likely passerby, the enemy. And hospitality was withheld by the most likely passerby, a Jewish Levite and also a priest. We are reminded of the Writings of the Psalms, “For it was you who formed my inward parts; you knit me together in my mother’s womb. I praise you, for I am fearfully and wonderfully made (Psalms 139:13-14a, NRSV). Here we see and believe that all persons, regardless of any identifying feature, are made in the Imago Dei. So I ask, what are the borders that are drawn in our communities, and even in our own congregations? How are we complicit in blessing the empire? How are we challenging the empire? Have we well researched the US’s immigration policy and how difficult it is to achieve a US citizenship unless you marry a US citizen, are independently wealthy, a famous athlete, a scientist, etc.? Are we aware of the current trade policies, like the North American Free Trade Agreement (NAFTA), that have significantly contributed to the desperate poverty in Mexico and Central American countries? What is the role of the Church as a social movement? And is this role a prophetic voice? If we truly believe that all persons are made in the image of God, then how can we, as a church, allow migration to be criminalized? How can we allow hospitality to be criminalized? As a Baptist seeking ordination, I want to be able to answer that question with integrity after a lifetime in ministry. I want to be able to say that I lived my life and served in a church which sang, ate, and breathed radical hospitality. I apologize for my delayed posts as of late as I have been trying to meet other deadlines in a busy spring semester; however, ideas for posts and this blogging community are frequently on my mind. It is my great pleasure to relay to you the sentiments of Dr. Shirin Ebadi. This past Friday night, Belmont University partnered with STARS to host the Mid-South Peace-Jam event. A human rights organization, Peace-Jam teaches youth about peace, allows them to develop peace proposals for various topics, and then present these to Nobel Peace Laureates at an annual conference. Pretty cool, huh?! This year, Dr. Ebadi was invited to receive the youth peace proposals and to be the keynote speaker. The night began with a techie-heavy video that defined the sometimes ambiguous term: “human rights.” The short video can be found here and is well worth your time. 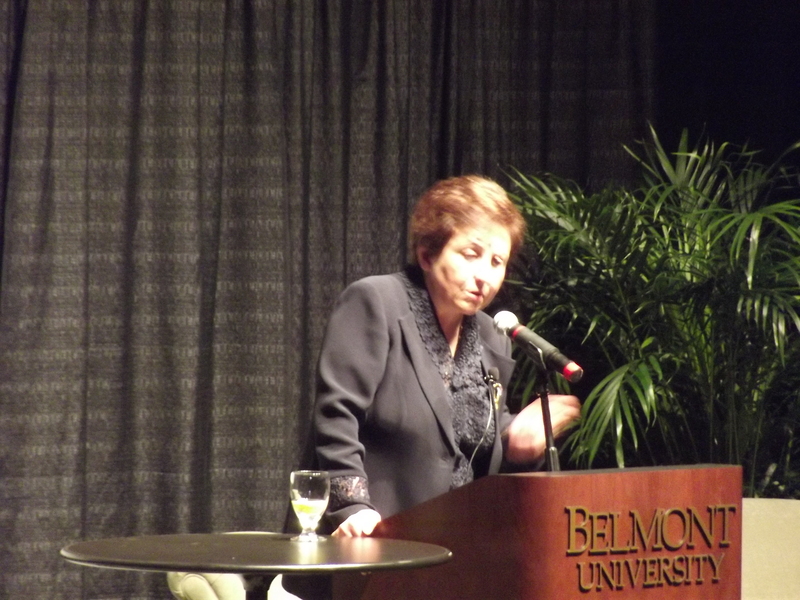 After video, Dr. Ebadi took the stage. In 2003, Dr. Ebadi, an Iranian lawyer, was awarded the Nobel Peace Prize at a historic ceremony, signifying the first Iranian to have received this distinction. Dr. Ebadi is a small woman with a big voice. She spoke of the disjunct between the Iranian people and their government, stating that many Iranians do not promote the enrichment of uranium in their country, even though their government will not back down from it. She spoke of Iran’s involvement in Syria and about human rights violations occurring within Iran’s borders. Two womens testimonies in court are the equivalent of one man’s; by law, the life of a woman is considered half of that of a man’s. If one is not a Shi’a Muslim, life is very difficult, and often results in religious persecution (even Sunni Muslims experience this in Iran). She spoke of the harsh economic sanctions imposed on Iran by western countries (ie. the US), sanctions which have affected the citizens in many detrimental ways. She suggested this was not the best or most humane way to force the government to disarm; instead she suggested very specific political sanctions. When asked when she believes Iran will be a full democracy, she questioned the definition of democracy. Yes, Iranian citizens can vote, but do they all have basic human freedoms, such as a freedom of speech and religion? No. So, in her opinion, a true democracy does not exist in her country. She is hopeful that such structure will come through students and through feminists: stating: “The feminist movement is very strong in Iran, so is the student movement. I am sure that one day democracy of Iran will be brought through the youth.” I am happy to suggest the same is true for America, in that, I believe positive change is coming through students and feminism. Asking the last question, a female student quietly inquired: “What can we do?” Shirin responded by saying: students must not be indifferent about what goes on in their country and the world. They must be informed activists. They must have larger goals for their life than achieving PhD’s or buying houses, (though these aren’t inherently negative), they must be real human beings. Though she is currently exiled to London, it is clear that Shirin is still fighting for the human rights and dignities of her countrymen/women. Though this woman can’t be taller than 5’1, is Iranian, and does not speak my native tongue, I suspect she and I are a lot alike. We believe that equality is a prerequisite for peace and that we, as humans, have a social responsibility to each other to work for these human rights. She and I realize that when women are disenfranchised, so are children, and so are men, everyone is. That when Iranians and Syrians suffer human rights violations, we do as much injustice to ourselves as we do to the sufferers of it when we refuse to care or engage. Her eyes told me she had seen much injustice; her hands showed me that she had fought it with ferocity, not because she was suffering its oppression, but because this was what “being human” meant to her. Is equality a prerequisite for peace? Are my standards too high, my thoughts too idealistic?